Dear Dumb Diary - Book 6 - The Problem With Here Is That It's Where I'm From. 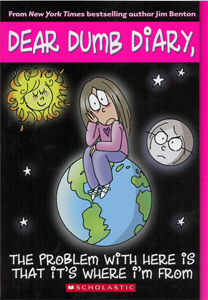 Home > Dear Dumb Diary > Dear Dumb Diary - Book 6 - The problem with here is that it's where I'm from. Beautiful glorious news! Today they told us that something went stinkyfully wrong with heating or ventilation system or something over at Wodehouse Middle School...They're bussing kids to different nearby schools, and Mackerel Middle School is one of them.